People's Artist of Uzbekistan, Kizlarkhon Dusmuhamedova. participants can attend an evening concert and enjoy our on-site Chaikhona Tea House and the Silk Road Bazaar. This Silk Road Dance Company production , based on the history and myths of ancient Egypt, won the 2003 Kennedy Center Local Dance Commissionig Project Award. Join Silk Road Dance Company for a very special evening as we step on foreign soil at one of Washington's biggest and most majestic embassies for a night filled with Turkish food, culture, music, dance, film, art, diplomats, and much much more! In honor of this festive event, Silk Road Dance Company presented a colorful program of Bollywood choreography as well as traditional Afghani dances. presented a salute to the 100th anniversary of the Azerbaijani operette "Arshin Mal Alan,"
People's Artist of Uzbekistan Kizlarhon Dusmuhamedova. Silk Road Dance Company brings the excitement of Bollywood to an international convention at Baltimore's Waterfront Marriott. This film captures a live performance of a sumptuous dance production by Silk Road Dance Company. Based on Nizami Ganjavi's epic poem, the concert tells the story of King Bahram Gur and his seven brides from different corners of the world. Silk Road Dance Company presented classical Persian dance as well as an energetic Bandari folklore piece. Visitors enjoyed four distinct sets of Azerbaijani folk dances on the National Mall in Washington DC. Azerbaijani and Afghani dances at this cultural festival celebrating the diversity of the Muslim World. School of International Service Atritum. The Iranian Cultural Society of GWU presents a Nowruz party featuring Silk Road Dance Company. 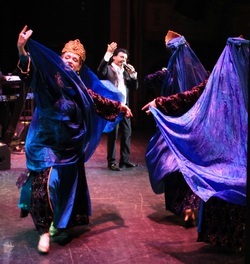 The music and dance of Central Asia come to life on stage with this unique, exciting ensemble. With dazzling costumes and authentic choreography, tales of ritual and romance, seasons and celebration weave a centuries-old spell. used towards their charitable work in Kyrgyzstan. Silk Road Dance Company brings the color and excitement of Persian dance to this festive celebration. Last year 20,000 people attended this joyous community celebration. Join Silk Road Dance Company in welcoming Spring ot the Metro DC area! Celebrate the beauty of Spring and Persian New Year with a banquet of traditional foods and Persian wine. The Nowruz Commission is a non-profit multi-cultural public diplomacy organization dedicated to promoting the spirit of Nowruz. 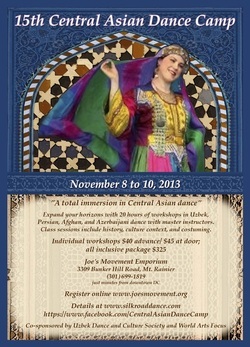 Music and Dance performances from along the Silk Road. 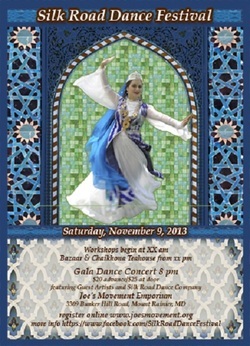 Silk Road Dance Company presents three dance sets; guest artists from Central Asia will also perform. Appearing for the first time at Bethesda's Round House Theatre, Silk Road Dance Company present a site-specific prelude for the 2013 Dance Bethesda concert. This free concert features choreography from all five recipients of this year's award. Laurel Victoria Gray's new work is the finale from a projected concert piece, THE PEARL OF THE GULF,which was inspired by Silk Road Dance Company's trip to Qatar and an Arabian Night's tale of a princess from an Underwater Kingdom. Three dynamic companies combined to celebrate the dance from the ebullient Hindi-language films from Mumbai – Bollywood. The award-winning Silk Road Dance Company, under the Artistic Director Dr. Laurel Victoria Gray, and the Jayantika Dance Company, directed by Jayantee Paine-Ganguly, and Urban Impact Youth Company.